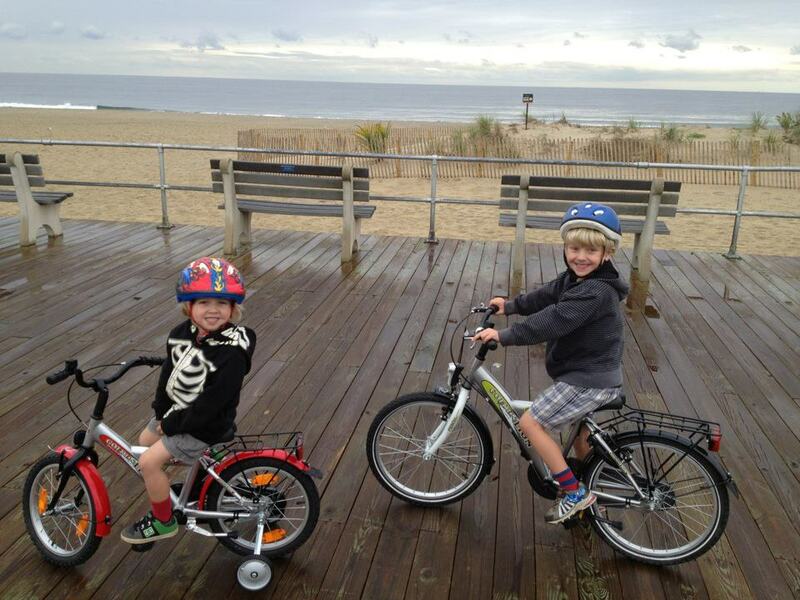 The boys received early Christmas gifts from their grandparents, new bikes! The bikes were on sale at Rolling Orange in Brooklyn. Brian went with the boys to pick them up on Sunday and since then they have not stopped pedaling. Since Summer is now over bikes are allowed back on the boardwalk. It's a great place to ride, especially for the kids. Now we just need to get small baskets or pannier bags for their rear racks. Then they can start to carry some of their own stuff too. We will be donating the boys old bikes to Second Life Bikes in Asbury Park. Fenders and racks! Sweet. Could you share the brand and sizes? Sure! They are Golden Lion bikes. Ben has a 16" and Nat now has a 20"
Whoo hoo! 20in. They grow up...and now you can measure that growth in wheel size. Ha!